Athletes are always training hard to give themselves an additional edge when competing. While logging hours of practice and keeping your body physically fit can help you significantly improve your performance, these actions alone cannot help you reach your full potential. In order to maximize strength, balance, flexibility, range of motion, and endurance, your muscles must be properly aligned. This alignment starts in the jaw muscles and extends down through your body to your neck and back. If you have any alignment issues with your jaw, it will impact the function of these other muscle systems, preventing you from achieving peak performance when you compete. By correcting these alignment issues in your jaw, it allows the muscles in your back and neck to relax as well, improving your athletic performance. If you are interested in learning more about how an athletic mouthguard can help you achieve peak performance levels, please call 201-792-9400 today to schedule your consultation at our Hoboken dental office. Dr. Frank offers athletic performance mouth guards to help his Hoboken and Hudson County area patients reach their peak levels of performance in their athletic endeavors. These mouth guards are made using the principles of neuromuscular dentistry, the branch of dentistry used in the treatment of TMJ. Neuromuscular dentistry focuses on the alignment of the muscles and joints in your jaw and the impact this alignment has on the other muscles in your body. When your jaw is in its ideal resting position, your body is in a more relaxed and comfortable state. This allows your body to perform at peak levels. Hoboken neuromuscular dentist Dr. Frank DePaola is a dental provider of Power Balance Performance Mouth Gear. Unlike normal mouth guards, this revolutionary product aligns the jaw and spine properly through positioning of the bite. This innovative technology allows for performance benefits unavailable in traditional mouth guards only providing oral protection. 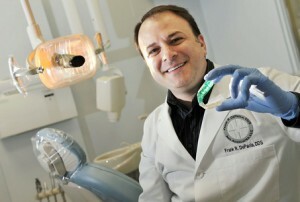 Dr. Depaola also uses Power Guard and Performance Guard, manufactured by Williams Dental Lab. Your mouth guard will be custom-crafted based on your jaw’s unique ideal resting position. Dr. Frank will use TENS therapy and the K7 system to relax your jaw muscles and locate their optimal resting position. While your jaw is in this position, an impression will be taken and sent to Williams Lab for use in construction of your mouth guard. Once the mouth guard has been created, Dr. Frank will custom-mold it to your bite for optimal levels of comfort and performance. Click here to view our videos about Athletic Performance Guards. Please contact The Practice at Maxwell Place using the form at the right side of the page or call 201-792-9400 today to schedule your initial athletic performance guard consultation. Dr. Frank DePaola serves patients in Hoboken, Jersey City, and throughout Hudson County, New Jersey.